Last week, we shared a big reveal of Lia Griffith’s holiday tablescape, which we are super in love with! This week, we’re going to break down some of the amazing projects she included that don’t even look DIY. 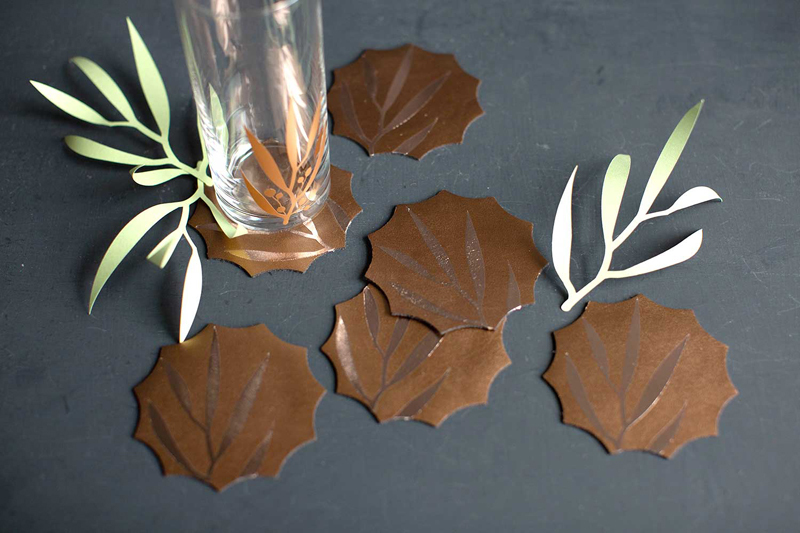 As a reminder, Lia has been a Cricut design partner for several years and is famous for her sophisticated designs and crepe paper flowers. 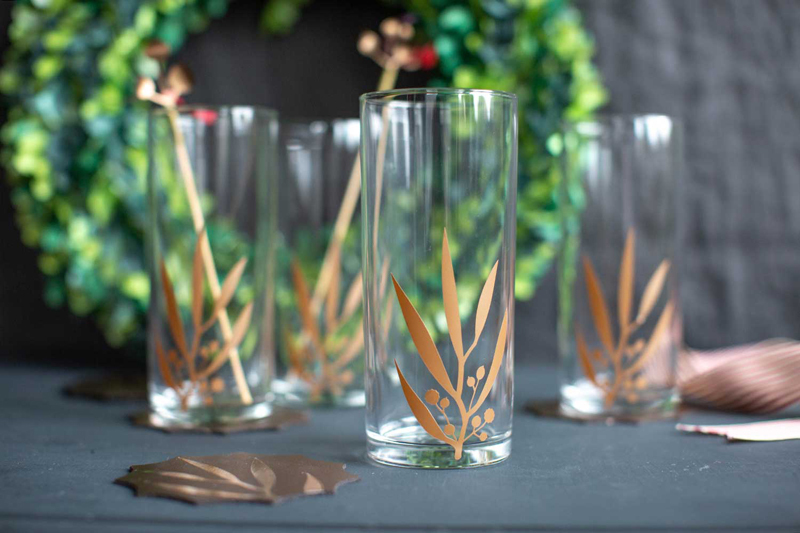 We’re thrilled to partner with her on several projects including a beautiful tablescape that spans the holiday season. We’ll start with her leather coasters. This is one of our favorite projects, because it adds such depth and texture to the mixed material aspect of this tablescape, Head over to the project in Design Space, and make along with us! Check the EasyPress Interactive Guide for the settings for these projects. Remember, if you want to alter the project, select Customize, then use the tools in the Edit panel to make changes before you cut. StrongGrip Mat - Place metallic leather smooth side down onto the mat. Tape down the edges of the leather to prevent shifting during cutting. Use a deep cut blade, with the 8 mm leather setting. We recommend trying a small test cut shape on a small scrap before cutting the entire project, to accommodate the vast variety of leather that can be used. We recommend 5 oz weight (2 mm) with a relatively stiff feel, for this project. Use a weeder tool to remove the negative pieces so just your design remains on the clear liner. Apply the iron-on layers to your project using a Cricut EasyPress™ and Cricut EasyPress Mat with our Interactive Guide, linked above, for the perfect time and temp settings; or use a household iron or heat press and a press cloth. Ok, how did it go? Fun, right? We LOVE to see iron-on and leather together. 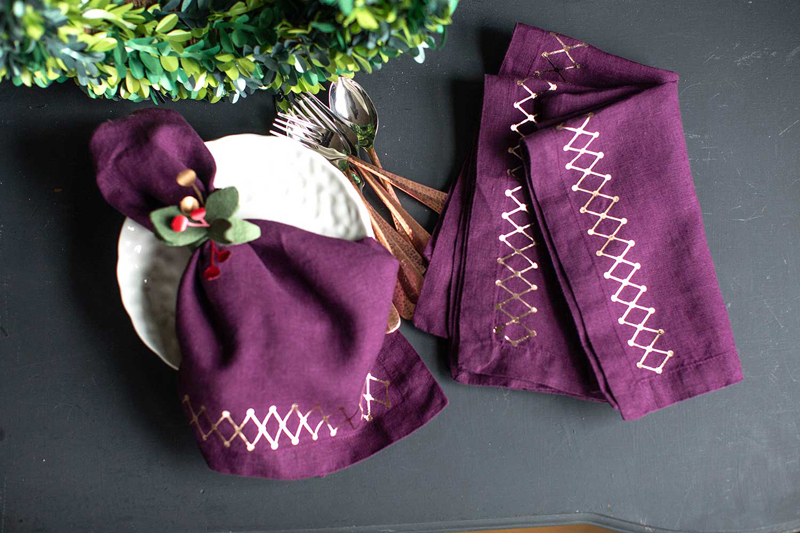 Now, while we have your EasyPress out, let’s make the gorgeous deep purple napkins! If you want to alter the project, select Customize, then use the tools in the Edit panel to make changes before you cut. Press the napkins if needed. Apply the iron-on layers to your project using a Cricut EasyPress 2™ and Cricut EasyPress Mat with our Interactive Guide, linked above, for the perfect time and temp settings; or use a household iron or heat press and a press cloth. Ready for one more?! Let’s get these cute vinyl glasses made! Follow the prompts in Design Space® to cut the images from the vinyl. Remove the unneeded pieces using a weeder tool. It is usually easiest to move from the inside out when weeding. Use Transfer Tape and your Scraper Tool to apply the vinyl cuts to your project. Make sure surfaces you plan to adhere to are clean and dry. How did you do? Share with us in the comments! Next week, we will tackle other elements of her tablescape; and with that, you’ll be ready to host your best holiday dinner yet!